The Arts & Sciences Award Program is available to students who are deaf and hard of hearing who are in grades one through twelve. Awards allow students to participate in after-school, weekend or summer programs focused on developing skills in the arts or sciences. Programs may be offered through museums, nature centers, art or music centers, zoos, space and science camps, dance and theater studios, martial arts studios or any other program with a focus on the arts or sciences. Awards cannot be used for programs that offer academic credit, travel or study abroad, recreational summer camps, sports camps or sports including figure skating or gymnastics. The 2019 program will close on March 29, 2019. Bilateral hearing loss or Auditory Neuropathy (AN) must have been diagnosed prior to the child’s fourth birthday (pre-lingual). Note: Children with unilateral (one-sided) hearing loss or unilateral AN do not qualify. The child’s hearing loss must be in the moderately-severe to profound range. This means that the child must have an unaided Pure-Tone Average (PTA) of 55 dB or greater in the better-hearing ear in the speech frequencies of 500, 1000, 2000 and 4000 Hertz (Hz). 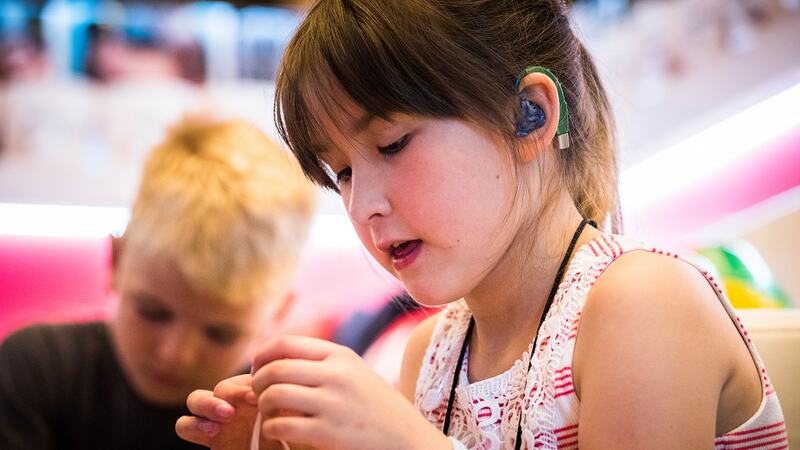 Children with cochlear implants meet this eligibility requirement. Note: This may not apply for children who have been diagnosed with AN. For information on required documentation for AN, please see the “documentation” section on the Application Submission Instructions page of the application packet. Formula for calculating the PTA: on the unaided audiogram, look at the results for the better hearing ear at 500, 1000 2000 and 4000 Hertz (HZ) and add those four numbers together, then divide that total by four. the result is the pure tone average. to be eligible for this award, the child’s PTA must be 55 db or greater. The child must be at least six (6) years of age and not older than 19 years of age as of December 31, 2019 and currently attending elementary or secondary school (grades 1 through 12). The child must be enrolled in or registered for the science or art program selected. Note: All eligible applicants will automatically receive a free membership to AG Bell. Send us an email. Please allow three business day for a response.